Is the quality of the non-native Douglas-fir wood produced in the Czech forests comparable to native softwoods? Giagli, K., Timko, L., Gryc, V., & Vavrčík, H. (2019). "Is the quality of the non-native Douglas-fir wood produced in the Czech forests comparable to native softwoods?" BioRes. 14(2), 2931-2945. Important physical and mechanical properties were evaluated for Douglas-fir wood produced in a non-native environment. The specimens were obtained from 15 healthy co-dominant trees growing in three different sites located in the Czech Republic; they were studied for density, shrinkage, compression, and bending strength. The average density of the wood was 562.74 ± 62.47 kg·m-3 at 12% MC. The total volumetric shrinkage was in line with the respective literature, whereas the compression strength and modulus of rupture were found to be higher than the native Douglas-fir wood as well as several European softwoods. The properties of the wood produced in the Czech forests indicate the possibility of producing Douglas-fir timber of high quality. Douglas-fir [Pseudotsuga menziesii (Mirb.) Franco] is one of the fastest growing conifers in the temperate zone, and one of the most important lumber tree species in the world. Its natural distribution covers a vast area of the western North America, where the species is widely scattered from the mountains of Mexico to British Columbia, Canada (Bormann 1960; Lausberg et al. 1995, Viewegh et al. 2014; Remeš and Zeidler 2014). Two native varieties have been recognized; the coastal Douglas-fir [P. menziesii (Mirb.) Franco var. menziesii] and the Rocky Mountain Douglas-fir [P. menziesii var. glauca (Biessn.) Franco] (Lausberg et al. 1995). Hence, the species has a natural ability of adapting to various environmental conditions (soils, climates), expanding from the higher elevations of northern America (inland; cold winters and dry summers) to the lower elevations (coastal areas; moderate winter temperatures and ample precipitation) and setting highly stable forest stands (Bormann 1960; Zhang and Hebda 2004; Beedlow et al. 2013; Viewegh et al. 2014). In the mid-19th century, Douglas-fir was introduced into western European forests, replacing important native European tree species such as Norway spruce and European larch (Remeš and Zeidler 2014). In France, Douglas-fir became the most planted tree species during the second half of the 20th century (Polman and Militz 1996; Ferron and Douglas 2010). Several studies on Douglas-fir wood produced in Southern Germany have underlined the importance of the species (Hapla 2000; Rais et al. 2014; Blohm et al. 2016). Douglas-fir was also introduced in New Zealand, where its resource exceeded 60,000 ha and became the second most important non-native timber species after Pinus radiata in the country (Miller and Knowles 1994; Lausberg et al. 1995). Interest in Douglas-fir was triggered mostly by the high wood production volume of the non-native species noticed in Europe and New Zealand (Ledgard and Belton 1985; Greguš 1996; Remeš and Zeidler 2014; Podrázský et al. 2016). Furthermore, its apparent adaptive ability to various sites and climates (Bormann 1960; Lausberg et al. 1995; Zhang and Hebda 2004; Beedlow et al. 2013; Ruiz Diaz Britez et al. 2014) prompted the idea of replacing native European species with Douglas-fir (Augusto et al. 2003; Menšík et al. 2009; Kantor and Mareš 2009; Kubeček et al. 2014; Remeš and Zeidler 2014; Podrázský 2015; Podrázský et al. 2016; Blohm et al. 2016). In many cases it was reported that the quality of the produced timber differed noticeably from the imported timber (Polman and Militz 1996; Rais et al. 2014). Comparative studies on the physical-mechanical properties of the introduced Douglas-fir in Europe, revealed noteworthy variations in the findings, attributed mostly to different provenances, site conditions, tree-age, and tree-position in the stand (St. Clair 1994; Podrázský et al. 2016). Namely, the Douglas-fir timber from the North America showed a lower bending and compression strength at comparable density (Polman and Militz 1996). In the Netherlands, Douglas-fir exhibited higher wood density and bending strength, while the compression strength values bore the resemblance to Norway spruce and Scots pine (Polman and Militz 1996). Nevertheless, a large variance of the Douglas-fir timber quality has been noticed, while recent studies reported that the alterations of the available forest resources have negatively affected the properties of the wood (Dahlen et al. 2012; Rais et al. 2014). In the Czech Republic, Douglas-fir is considered to be the most perspective introduced species, planted for more than one century now in the area. Hence, well adapted local populations are already available for exploitation (Menšík et al. 2009; Podrázský et al. 2016). Although the current coverage is limited to 5,800 ha, representing hardly 0.22% of the forestland (Kouba and Zahradník 2011), the future potential has been estimated to be higher (Podrázský and Remeš 2010; Podrázský et al. 2016). Most of the studies conducted in recent years on Douglas-fir growing in the Czech Republic were focused on the production volume and yield potential (Martiník and Kantor 2007; Kantor and Mareš 2009; Kantor et al. 2010; Viewegh et al. 2014; Podrázský et al. 2016) as well as the ecological parameters of the introduced species (Menšík et al. 2009; Kubeček et al. 2014; Kupka et al. 2013; Podrázský et al. 2016). It seems that ecologically the species demonstrates great features, i.e., easy adjustment, drought tolerance, and good growth. The ecological value of the species increases since many studies claim that it causes no hazards to the existing forests but upgrades the quality of the forest soils (Menšík et al. 2009; Remeš and Zeidler 2014). Nowadays, it is suggested that Douglas-fir potentially can contribute a larger share of the productivity of Czech commercial forests by partly replacing the native Norway spruce (Podrázský et al. 2013). Practically, until today, several articles have been supporting this idea, based on environmental parameters (drought tolerance, soil quality) and the high production volumes (Menšík et al. 2009; Viewegh et al. 2014; Kubeček et al. 2014; Podrázský 2015). Nevertheless, there is still only a limited number of reports on the quality of the Douglas-fir wood produced in the Czech Republic (Hapla and Knigge 1985; Hapla 2000; Remeš and Zeidler 2014) which can hardly provide enough information on the properties of the produced timber in the country. Timber from Douglas-fir is apparently a valuable material for the forest products industries all around the world (United States, New Zealand and Europe), producing dimension lumber, poles, plywood, pulp, and a vast variety of other solid and composite products (Landgren et al. 1994; Lausberg et al. 1995; Johnson and Garner 2006). A thorough study based on the properties of the produced wood, can potentially confirm the excellence of the locally produced timber and promote the idea of increasing the Douglas-fir wood production in the Czech Republic. In this frame, the aim of this study was to analyse the selected wood properties (density, shrinkage, compression strength and modulus of rupture – MOR) of Douglas-fir [Pseudotsuga menziesii (Mirb.) Franco] wood obtained from three different sites in the Czech Republic in comparison with native softwoods. 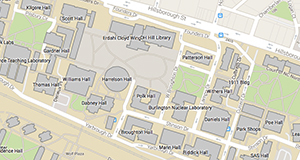 Three sites (A, B, and C) with different forest types were selected. In terms of age, the forests were around 90, 75, and 65 years old, respectively, according the forest management plans. The samples from the site A originated from the “Forest and Parks of the Town Trutnov” forest, in the Čižkovy kameny area. The forest was composed of Norway spruce (64 %) which was the dominant species, larch (23%), Scots pine (8%), Douglas-fir (3%), fir (1%), and birch (1%). The diameters of the logs ranged from 50 to 57 cm at breast height (1.30 m from the ground). The samples from the site B were collected from the University Forest Enterprise in Křtiny, in Vranov area. The stand structure was consisted of larch (29%), Douglas-fir (22%), European beech (19%), lime (14%), Norway spruce (6%), Scots pine (6 %), sessile oak (3%) and hornbeam (1%). The diameters of the logs ranged from 43 to 62 cm at breast height. Finally, the samples from the site C also originated form University Forest Enterprise in the Habrůvka cadastral area composed of larch (30%), Douglas-fir (18%), European beech (18%), hornbeam (15%), sessile oak (10%), and Scots pine (6 %). The diameters of the logs ranged from 32 to 49 cm at breast height and they were around 65 years old. Five healthy co-dominant Douglas-fir trees were cut per site (15 in total). Logs were cut with length of 50 cm from 1.30 m from each tree. Central planks (6 cm thick) with pith in the axis were made by chainsaw and obtained from the central part of logs. The tree-ring width and percentage of latewood (%) on transversal section of the samples were measured. Transversal discs from each stem were obtained (breast height) to measure the tree-ring widths (TRW). All samples were measured (at an accuracy of 0.01 mm) using a TimeTable device (SCIEM, Vienna, Austria). The obtained TRW series were processed in the PAST4 software (Knibbe 2004) to build mean series for each species/site. The latewood width was measured per tree ring and the percentage of the latewood (%) was finally calculated. The samples of 2×2×3 cm (for evaluated density at 12% moisture content (MC), swelling and compression strength) or 2×2×30 cm (bending strength) were produced according the ČSN 490012 standards. Each sample was labeled according their position in radius keeping the direction from bark to pith (A–K). In total, 1358 samples were measured for the density and shrinkage of the Douglas-fir wood, while 394 and 341 samples were used for the compression and MOR measurements, respectively. where ρ is density of wood at 12% MC, m is the weight of each sample (g), and a, b, and c are the dimensions of the respective sample (mm). where limax is the size of the tested sample (mm) in the particular anatomic direction at MC higher than the hygroscopicity level, and limin is the size of the sample (mm) in the particular anatomic direction at 0% MC. where Fmax is the maximum load (N), and a and b are the transversal dimensions of each sample (mm). where Fmax is the maximum load (N), l is the distance between supports (mm), b is the width of the sample, and h is the height of the sample (mm). The universal testing machine Zwick Z050 was used for analysis of the mechanical properties. The analysis of the data was performed by the Statistica software. The average density of the Douglas-fir wood at 12 % MC (Fig. 1) produced in the Czech Republic was found to be 551.0 ± 57.1 kg·m-3 (Site A), 572.3 ± 69.7 kg·m-3 (Site B) and 586.7 ± 60.2 kg·m-3 (Site C). The lowest values were recorded at the site A, where the Douglas-fir trees were the oldest of the examined sites. Nevertheless, it was noticed that the forest in site A was mostly composed of Norway spruce (64%), whereas the introduced Douglas-fir trees were limited to only 3%. Hence, it was supposed that the position of the trees and density of the stand may have possibly affected the properties of the produced Douglas-fir wood. Shrinkage is a devastating property especially for the utilisation of wood. It is affected by several factors, i.e., density of wood, anatomical structure, MC, etc. (Tsoumis 1991). The present results showed that the volumetric shrinkage of the Douglas-fir wood growing in the Czech Republic ranged from 12.1 ± 2.0% (site B) to 13.1 ± 1.7% (site C) while the wood samples obtained from the site A provided intermediate values (12.7 ± 1.7%). The mechanical strength of the produced wood is a key factor for the utilization of the timber. The compression strength of the studied samples showed that the higher values were found in the site A (59.4 ± 7.9 MPa), while the rest of the two examined sites had similar results, i.e., 54.0 ± 9.1 MPa (site B) and 54.6 ± 9.3 MPa (site C). The relationship between the compression and MOR is expected to be strong (Green et al. 2008). Generally, Douglas-fir produces timber of good mechanical properties and mostly high MOR in relation to its density (Tsoumis 1991). Samples obtained from the site A reached 79.9 ± 15.3 MPa for MOR, 85.1 ± 19.6 MPa from the site B and 84.3 ± 16.1 MPa from the site C.
The average density of wood obtained from the three studied sites altogether was found to be 562.7 ± 62.5 kg·m-3 at 12% MC, which is quite higher than the density of the wood produced by Douglas-fir trees growing into the native area of the species (Table 1). The present findings were completely in line with a recent study conducted on Douglas-fir from the afforested agricultural land in the Czech Republic (568 ± 59 kg·m-3 at 12% MC) (Zeidler et al. 2018). This is higher than the values given by Remeš and Zeidler (2014) for the species growing in the Czech Republic (488 kg·m-3) and Alden (1997) for the native species growing in the interior North (480 kg·m-3) or the interior West (500 kg·m-3) of North America. The present findings were in line with the values given by Alden (1997) for the native species of the coastal areas (540 kg·m-3) as well as by Göhre (1958) 542 kg·m-3, Dinwoodie (2000) 590 kg·m-3 or Blohm et al. 2016 (526 kg·m-3). It was found that the average volumetric shrinkage in our three sites was 12.6 ± 1.8%, which is close to the values given for the native Douglas-fir. Practically, the present results were in line with literature (Alden 1997; Simpson and TenWolde 1999; Remeš and Zeidler 2014). The average compression strength was found to be 57.2 ± 8.9 MPa, which is within the range of the respective values given for the native growing trees by Wagenführ (2000) but higher than those reported by Tsoumis (1991) (51.0 MPa), Niemz (1993) (50.0 MPa), or Alden (1997) (52.1 MPa). In comparison with its density, the species demonstrates good strength properties, and mostly static bending (Tsoumis 1991). The present results for MOR reached 81.9 ± 16.7 MPa on average and behaved in a similar way with the native species (Tsoumis 1991; Alden 1997; Göhre 1958). Nevertheless, it was found to be rather higher than the values (70 ± 17 MPa) given by Zeidler et al. (2018). Overall, it was found that the properties of the Douglas-fir wood produced in the Czech forests comply with the given values for the native timber. At the examined sites (A, B, C), the average tree-ring widths located close to the pith (1 to 15) were found to be initially rather high, and then they became promptly narrower in the next set of 15 (16 to 30) tree rings (Table 2). Eventually, the tree-ring width gradually decreased, approaching the cambium. Nevertheless, the samples obtained from site A revealed a different trend since the average tree-ring width increased approaching the cambium (61 to 75, 76 to 90). According to the forest plans of the respective area, a number of trees were removed from the forest (site A) during that period. Rigozo et al. (2004) has reported that when more sun is allowed to enter in the forests, this promotes tree growth and increases the tree-ring widths. At all sites, the lowest average proportion of the latewood (%) along the stem radius was found to be always close to the pith (1 to 15 tree rings) as expected (Table 3). Generally, the average proportion of latewood ranged from 32.2 ± 5.8% closer to pith to 50.3 ± 5.4% as approaching to the cambium. Previous studies report that wood density in Douglas-fir typically tends to decline radially (from the pith to the bark) for approximately 5 to 10 years. Subsequently, the wood density increases, reaching values higher than those near the pith. Nevertheless, sometimes it increases without reaching that value, or gradually continues to increase for more than 50 years (Jozsa and Kellogg 1989; Gartner et al. 2002; Acuna and Murphy 2006; Remeš and Zeidler 2014), which is mainly due to tracheid anatomical changes (Rathgeber et al. 2006). The present findings on wood density along the stem radius coincided with this trend (Fig. 2), while a clear increase of the values was detected as the tree grew older. Fig. 2. Average Values of Properties (Density, Volumetric Shrinkage, Compression Strength, Modulus of Rupture – MOR) of the Douglas-fir Wood Along the Stem Radius, from Bark to Pith (A–K). A similar pattern was also followed by the other examined properties. Volumetric shrinkage of the Douglas-fir samples was low close to the pith, increased rapidly, stabilized for a while, and then increased again reaching close to the bark. In the same frame, compression strength was the lowest near the pith and attained the highest values near the bark. The increasing trend from the pith to the bark was recorded also for the MOR. The density varies from earlywood to latewood within tree rings and within individual trees (Acuna and Murphy 2006). Previous studies have confirmed that, in the conifers, mostly the radial diameter and the cell-wall thickness of the latewood tracheids influence the density of the wood in the tree rings (Wimmer 1995; Rathgeber et al. 2006). This study attempted to correlate the values of each examined property with the tree-ring widths and proportion of the latewood (Table 4, Fig 3). 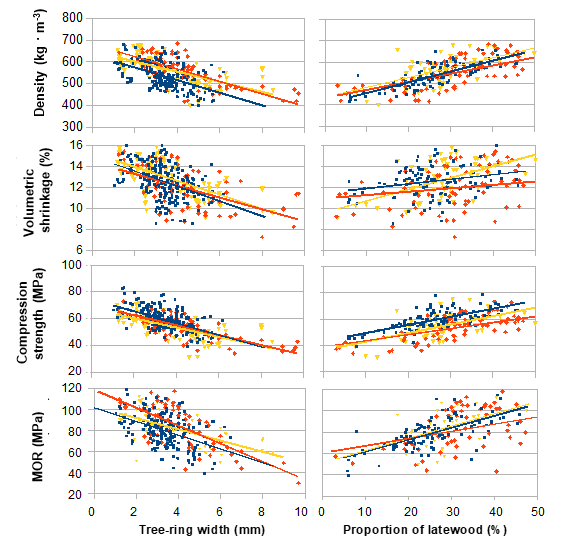 It was found that the tree-ring width showed the highest correlation with the compression strength of the Douglas-fir wood (R = 0.42), whereas the proportion of latewood was mostly correlated with the density of the wood, as expected (R = 0.46). The present results showed that the volumetric shrinkage of the samples was less affected by the proportion of the latewood. Based on the present results, Douglas-fir wood demonstrates similar or even higher density when the species is growing in the Czech Republic. It was concluded that the Douglas-fir timber produced in the Czech Republic could potentially bear the comparison with most of the native European softwoods (Table 5). Namely, it had higher density than Scots pine (530 kg·m-3) and could be comparable to the density of the European larch (600 kg·m-3). As mentioned above, the volumetric shrinkage of the non-native Douglas-fir was found to be equal to the values given for the native Douglas-fir or other native European softwoods. Hence, this factor cannot be decisive for future plans. Referring to compression strength (57.18 ± 8.86 MPa), the non-native Douglas-fir growing in the Czech Republic exhibits similar compression strength to Scots pine or European larch. Norway spruce on the other hand, barely reaches 30 MPa. In the same frame, MOR average values (81.95 ± 16.73 MPa) were found to be competitive with the respective average values given for the most of the native softwoods except Norway spruce. Remeš and Zeidler (2014) stated that the non-native Douglas-fir wood can be compared to Scots pine wood bending strength. The present findings apparently support this statement. In general, the non-native Douglas-fir wood outperforms native Norway spruce providing another strong argument of a future replacement in the forests. Conclusively, the xylem structure and wood properties are directly or indirectly connected to this ability of adapting and thriving in almost any non-native environment (Ruiz Diaz Britez et al. 2014). It is noted that the selection of the most appropriate Douglas-fir provenances is a key factor for better adaptation in the European sites (Podrázský et al. 2016). In accordance with our findings on a previous study on the oven-dry density of Douglas-fir growing in the Czech Republic (Giagli et al. 2017), it was confirmed that the basic density of trees growing in more sites is also higher than the density of the native trees. Dalla-Salda et al. (2009) noted that extreme drought events result in increasing the wood density functioning as a selection parameter for the species. Hence, in the future, the drought-resistant Douglas-fir trees growing in the European forests will potentially produce timber of high wood density. Apart of this, higher values of compression and bending strength were detected in comparison to the native timber, which is in line with the literature (Rijsdijk and Laming 1994; Wagenfür 2000). It is worth mentioning that Douglas-fir growing in the Czech Republic outperformed most of the native European softwood, especially Norway spruce. This can support the idea of future partial replacement of the drought sensitive Norway spruce with probably more valuable (ecologically, financially, technologically) species in the Czech forests. Douglas-fir seems to be a promising candidate for this purpose. The average density of the Douglas-fir wood growing in the Czech Republic was found to be 562.74 ± 62.47 kg·m-3 at 12 % MC, resembling to the native species of the coastal areas. The average volumetric shrinkage (12.6 ± 1.8 %) of the Douglas-fir wood was found to be in line with the literature, similar to the native timber. Shrinkage can barely be a decisive parameter for future planning since our findings coincide with other studies. The average compression strength was found to be 57.2 ± 8.9 MPa and MOR reached 81.9 ± 16.7 MPa on average. Non-native Douglas-fir wood growing in the Czech Republic outperformed most of the native European softwoods, especially Norway spruce. This article was supported by the European Social Fund and the state budget of the Czech Republic, project “The Establishment of an International Research Team for the Development of New Wood-based Material” Reg. No. CZ.1.07/2.3.00/20.0269. We would also like to thank all the students for their valuable lab work. Acuna, M. A., and Murphy, G. (2006). “Geospatial and within tree variation of wood density and spiral grain in Douglas-fir,” Forest Products Journal 56(4), 81-85. Alden, H. A. (1997). Softwoods of North America. (Gen. Tech. Report No. FPL–GTR–102), U.S. Department of Agriculture, Forest Service, Forest Products Laboratory, Madison, WI, pp. 151. Augusto, L., Dupouey, J. L., and Ranger, J. (2003). “Effects of tree species on understory vegetation and environmental conditions in temperate forests,” Annals of Forest Science 60, 823-831. Bormann, B. T. (1960). An American wood: Douglas-fir (Pseudotsuga menziesii (Mirb.) Franco) (Report No. FS-235), US Forest Service, United States Department of Agriculture. Dinwoodie, J. M. (2000). Timber: Its Nature and Behavior, 2nd ed. Taylor & Francis, New York, NY. Ferron, J. L., and Douglas, F. (2010). “Douglas-fir in France: History, recent, economic development, overviews for the future,” Berichte Freiburger Forstliche Forschung 85, 11-13. Giagli, K., Timko, L., Gryc, V., and Vavrčik, H. (2017). “Tree-ring widths and wood density variability of non-native species: A case study of Douglas-fir growing in the central Europe,” in: Proceedings of the 8th International Conference on Information and Communication Technologies in Agriculture, Food and Environment (HAICTA 2017), Chania, Greece, 21-24 September, pp. 571-579. Göhre, K. (1958). Die Douglasie und ihr Holz, Akademie-Verlag, Berlin, Germany. Green, D. W., Gorman, T. M., Evans, J. W., Murphy, J. F., and Hatfield, C. A. (2008). “Grading and properties of small-diameter Douglas-fir and ponderosa pine tapered logs,” Forest Products Journal (Forest Products Society) 58(11), 33-41. Greguš, L. (1996). “Production capacity evaluation of the tree species of the Kysihybli arboretum in Banska Stiavnica,” Forestry Journal 2, 87-114. Hapla, F. (2000). “Douglasie–eine Baumholzart mit Zukunft,” Forst und Holz 55(22), 728-732. Hapla, F., and Knigge, W. (1985). Untersuchung űber die Auswirkungen von Durchforstungsmassnahmen auf die Holzeigenschaften der Douglasie. Sauerlander, Frankfurt am Main, pp. 142. Jozsa, L. A., and Kellogg, R. M. (1989). An Exploratory Study of the Density and Annual Ring Width Trends in Fast-growing Coniferous Wood in British Columbia (CFS Contract Repl. No. 02-80-55-017), Forinlek Canada Corp., Vancouver, BC. Kantor, P., Bušina, F., and Knott, R. (2010). “Postavení douglasky tisolisté (Pseudotsuga menziesii /Mirb./ Franco)a její přirozená obnova na Školním polesí Hůrky Středních lesnických škol Písek. [The position of Douglas fir (Pseudotsuga menziesii /Mirb./ Franco) and its natural regeneration at training forest district Hůrky of the Secondary Forestry Schools in Písek. ],” Zprávy lesnického výzkumu, 55: 251-263. Kantor, P., and Mareš, R. (2009). “Production potential of Douglas fir in acid sites of Hůrky Training Forest District, Secondary Forestry School in Písek,” Journal of Forest Science 55(7), 312-322. Kouba, J., and Zahradník, D. (2011): “Produkce nejdůležitějších introdukovaných dřevin v ČR podle lesnické statistiky. [Production of the most important introduced tree species in the Czech Republic based on data of forest statistics. ],” in: Prknová H.(ed. ): Aktuality v pěstování méně častých dřevin v České republice 2011. Sborník referátů. Kostelec nad Černými lesy, 21. November 2011. Prague, Czech University of Life Sciences, Prague, pp. 52-66. Kupka, I., Podrázský, V., and Kubeček, J. (2013). “Soil-forming effect of Douglas fir at lower altitudes – A case study,” Journal of Forest Science 59(9), 345-351. Landgren, C., Bondi, M., and Emmingham, W. (1994). Growing and Harvesting Douglas-fir Poles (Extension Circular 1134), Oregon State University Extension Service, The Woodland Workbook, Corvallis, OR. Lausberg, M. J. F., Cown, D. J., McConchie, D. L., and Skipwith, J. H. (1995). “Variation in some wood properties of Pseudotsuga menziesii provenances grown in New Zealand,” New Zealand Journal of Forestry Science 25(2), 133-146. Ledgard, N., and Belton, M. C. (1985). “Exotic trees in the Canterbury high country,” New Zealand Journal of Forest Science 15, 298-323. Martiník, A., and Kantor, P. (2007). “Branches and the assimilatory apparatus of full-grown trees of Douglas fir Pseudotsuga menziesii [Mirb.] Franco) of a different coenotic position,” Ekológia (Bratislava) 26, 223-239. Menšík, L, Kulhavý, J., Kantor, P., and Remeš, M. (2009). “Humus conditions of stands with different proportion of Douglas fir in the Hůrky Training Forest District and Křtiny Training Forest Enterprise,” Journal of Forest Science 55(8), 345-356. Miller, J. T., and Knowles, F. B. (1994). “Introduced forest trees in New Zealand. Recognition, role, and seed source. 14: Douglas-fir Pseudotsuga menziesii (Mirbel) Franco,” New Zealand Forest Research Institute FRI Bulletin 124(14). Niemz, P. (1993). Physik des Holzes und der Holzwerkstoffe. DRW-Verlag. Weinbrenner, pp. 243. Polman, J. E., and Militz, H. (1996). “Wood quality of Douglas fir (Pseudotsuga menziesii (Mirb) Franco) from three stands in the Netherlands,” Annals of Forest Science 53, 1127-1136. Podrázský, V., Remeš, J., Sloup, R., Pulkrab, K., and Novotný, S. (2016). “Douglas-fir – partial substitution for declining conifer timber supply – Review of Czech data,” Wood Research61(4), 525-530. Podrázský, V., Čermák, R., Zahradník, D., and Kouba, J. (2013). “Production of Douglas-fir in the Czech Republic based on national forest inventory data,” Journal of Forest Science 59, 398-404. Podrázský, V., and Remeš, J. (2010). “Production and environmental functions of Douglas-fir on the School training Forest Kostelec nad Černými lesy territory,” in: Opportunities and risks for Douglas fir in a changing climate. Freiburg, 18–20 October, Freiburg, Universität Freiburg, pp. 64. Remeš, J., and Zeidler, A. (2014). “Production potential and wood quality of Douglas fir from selected sites in the Czech Republic,” Wood Research 59(3), 509-520. Simpson, W., and TenWolde, A. (1999). Wood Handbook – Wood as an Engineering Material (Forest Products Laboratory Gen. Tech. Rep. FPL–GTR–113), U.S. Department of Agriculture, Forest Service, Forest Products Laboratory, Madison, WI. St. Clair, J. B. (1994). “Genetic variation in tree structure and its relation to size in Douglas-fir. I. Biomass partitioning, foliage efficiency, stem form, and wood density,” Canadian Journal of Forest Research 24, 1226-1235. Tsoumis, G. (1991). Science and Technology of Wood– Structure, Properties, Utilization, Chapman and Hall, New York, NY. Viewegh, J., Martiník, A., Matějka, K., and Podrázský, V. (2014). “Douglas-fir (Pseudotsuga menziesii) stands and its herb layer in a Czech commercial forests,” Journal of Forestry Faculty (Kastamonu Üni., Orman Fakültesi Dergisi, Kastamonu Univ.,) 14(2), 209-214. Wagenführ, R. (2000). Holzatlas, Fachbuchverlag Leipzig im Carl Hanser Verlag, München, pp. 707. Wimmer, R. (1995). “Intra-annual cellular characteristics and their implications for modeling softwood density,” Wood and Fiber Science 27, 413-420. Article submitted: March 14, 2018; Peer review completed: April 30, 2018; Revised version received: February 9, 2019; Accepted: February 13, 2019; Published: February 21, 2019.